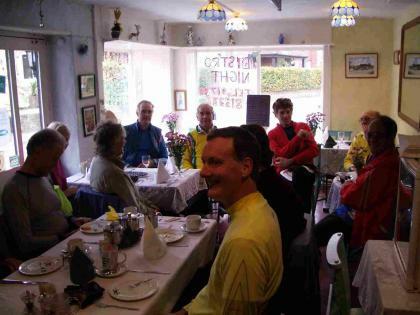 A 9.30 start from Chi Cross means the stand -in leader should leave Selsey by 8.45 and as usual he leaves at 9.00, so a fast ride needed to meet up with 4 members(Gillian,Richard ,Chris and Mike) on an overcast day. The pace slowed considerably (but well done Mike for coming out on a ride over the downs). Jeff used a cycle route through the city that avoids the main roads out to Westhampnett. Quiet lanes to Goodwood ridge and then the inevitable bit of A road before turning off at the bottom of Duncton hill to enjoy the quiet lanes and glimpses of winter sun to Coates and Fittleworth. Early lunch stop at Wyevale Garden Centre while we waited for others to drift in from Walberton and Littlehampton. Altogether we were at least a dozen. A return route via Pulborough town and Greatham bridge, Amberley and Whiteways kiosk for tea and a wad (Scottish expression) Westergate and Oving provided a different route back Worth getting out of bed for!. Sunday 13 November. 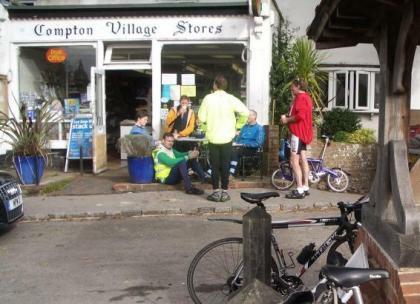 Walberton Pond Start, ride to the Royal Oak, Midhurst. 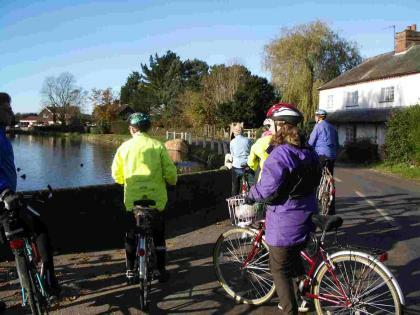 Colin led the Ride from the Pond and was joined by Phil and Mary, Edwin, Harvey, Gill and Sam. Weather was bright at first but clouding over and quite cold getting to about 10C with a strong NE wind. Lanes were taken via Fontwell and Eartham and then up to the Downs and a ride along the ridge to Pillygreen. 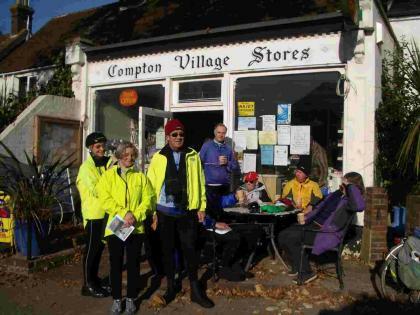 The ride then continued to East Dean and Singleton and a stop for elevenses and a warm up at the Moonlight Cafe, Cocking. The enormous slices of Cake supplied by the Cafe were consumed with relish. After half an hour the Chichester start riders arrived being Arthur, Eric, Mike Dunn, Richard, Avryl and Jan.
From Cocking the Chichester group went direct while the Walberton group took a longer loop via Stedham. At the Pub we were joined by Chris who came direct making a total of 14 out on the day. We also met some Arun Adur riders being Brian, Sue, Graham and John Maxim. 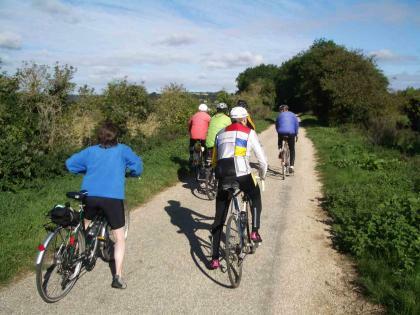 Some of the Chichester group headed back direct while Chris, Richard and John joined Colin’s group to head back on lanes via Heyshott and a stop for tea at West Dean Gardens Cafe. Mileage from and to the Pond was about 50. From and to Pagham was 58.